Area: 3.3 million sq. km. Coordinates: Lying entirely in the Northern Hemisphere, the Country extends between 8° 4' and 37° 6' latitudes north of the Equator, and 68°7' and 97°25' longitudes east. The Indian peninsula is separated from mainland Asia by the Himalayas. The country is surrounded by the Bay of Bengal in the east, the Arabian Sea in the west, and the Indian Ocean to the south. 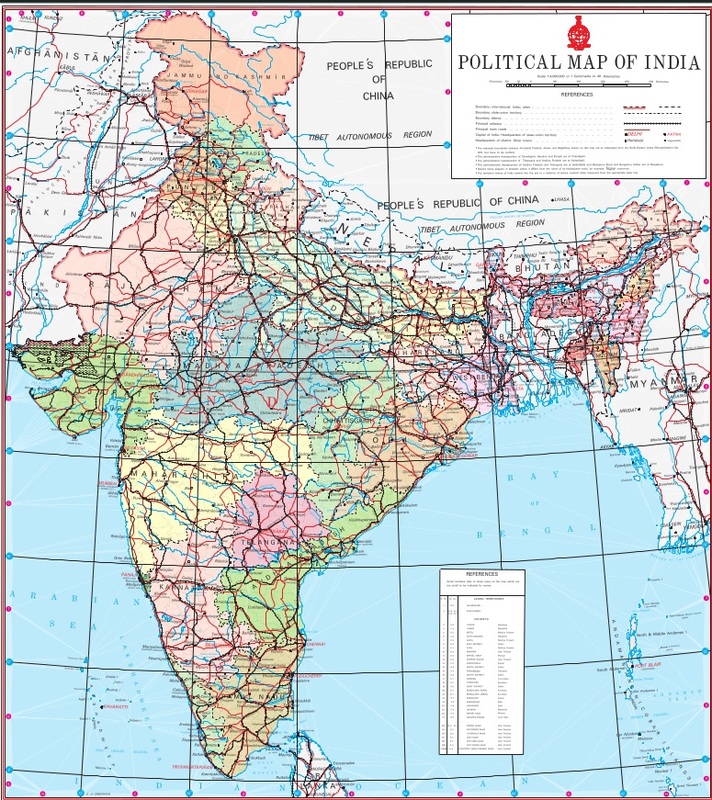 India occupies a major portion of the South Asian subcontinent. Border Countries: Afghanistan and Pakistan to the north-west; China, Bhutan and Nepal to the north; Myanmar to the east; and Bangladesh to the east of West Bengal. Sri Lanka in the South is separated from India by a narrow channel of sea, formed by Palk Strait and the Gulf of Mannar. Climate: The climate of India can broadly be classified as a tropical monsoon one. But, in spite of much of the northern part of India lying beyond the tropical zone, the entire country has a tropical climate marked by relatively high temperatures and dry winters. There are four seasons - winter (December-February), (ii) summer (March-June), (iii) south-west monsoon season (June-September), and (iv) post monsoon season (October- November). Terrain: The mainland comprises of four regions, namely the great mountain zone, plains of the Ganges and the Indus, the desert region, and the southern peninsula. Natural Resources: Coal, iron ore, manganese ore, mica, bauxite, petroleum, titanium ore, chromite, natural gas, magnesite, limestone, arable land, dolomite, barytes, kaolin, gypsum, apatite, phosphorite, steatite, fluorite, etc. Government Type: Democratic Republic with a Parliamentary system of Government. Administrative Divisions :29 States and 7 Union Territories. Constitution: The Constitution of India came into force on 26 January 1950. The Constitution of India is the fountain source of the legal system in the country. Executive Branch: The President of India is the Head of State, while the Prime Minister is the Head of the Government, supported by the Council of Ministers/Cabinet. Legislative Branch: The Federal Legislature comprises of the Lok Sabha (House of the People) and the Rajya Sabha (Council of States) forming both the Houses of Parliament. Judicial Branch: The Supreme Court of India is the apex body of the Indian legal system, followed by other High Courts and subordinate Courts. Ethnic Groups: All the five major racial types - Australoid, Mongoloid, Europoid, Caucasian, and Negroid find representation among the people of India. Religions: According to the 2011 census, Hindus constituted the majority with 79.8%, Muslims came second at 14.2%, followed by Christians, Sikhs, Buddhists, Jains, and others. Languages: There are 22 different languages that have been recognized by the Constitution of India, of which Hindi is an Official Language. English has by law been designated the language for official purposes. Indian economy experienced grow at a rate of 6.7 per cent in the year 2017-18 and in 2018-19, the economy is expected to grow at a rate of 7.3 per cent. © 2018 Embassy of India, Muscat, Oman. All Rights Reserved.